The traffic signals at Main Street and Garfield Avenue in Swanton will soon see changes. Changes are coming to the traffic signal at the intersection of Main Street and Garfield Avenue in Swanton. 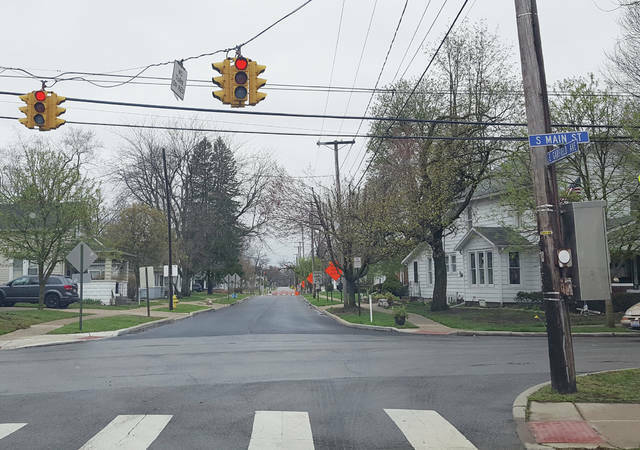 Beginning May 1, the signal will flash yellow on Main Street and red on Garfield Avenue from 11 p.m. to 6 a.m.
A flashing yellow light indicates that drivers are required to slow down and proceed with extreme caution. A flashing red light is treated the same as a stop sign. Vehicles must come to a full stop before proceeding further. The speed limit is not changed. Also, the “no turn on red” traffic sign will be updated. The new sign will indicate that there is no turning on a red light between 7 a.m. and 4 p.m. on school days. These changes are the result of a recommendation from the Public Safety Committee to Village Council. Village Council approved these changes in January 2019. In addition, village officials are working on getting an issue fixed at another intersection. A new vehicular loop detector is needed at the intersection of Hallett Avenue and Airport Highway because the current one was cut. This device is used to detect when a car is at a intersection.